Steppenwolf Theatre Company brought Tribes to Chicago this winter on the coattails of rave reviews. When the show premiered in London in 2010, The Wall Street Journal wrote, “It’s the best-written, best-plotted, deepest, most daring—and funniest—new play in recent years,” and it met similarly exuberant reviews Off Broadway, where it was listed as a critic’s pick by The New York Times. Now, with one week left of the show’s run, it is fair to ask if students should drop everything to get a seat at Steppenwolf’s rendition. The short answer is…maybe. The show centers around Billy, a 20-something deaf man played by deaf actor John McGinty, and his dysfunctional, eccentric, intellectual family that never learned sign language but taught him instead to be an expert lip-reader. The words around him come in torrents of quick, witty banter and, despite his exceptional skill, he misses jokes and arguments in handfuls. Then Billy meets Sylvia, a woman from a deaf family who’s slowly going deaf herself. She teaches him to sign and introduces him to the deaf community, creating tension and resentment among his tight-knit family. In many ways, Tribes fulfills its grand expectations. Deafness is an intrinsic identity, making it a long-overlooked but rich candidate for the thematic exploration of identity. Thus, the script is able to probe into this significant but frequently explored theme from a unique angle, examining how it both intersects with and is altered by communities. It also allows for an empathetic reflection on life without sound—particularly at the end of Act One as the beautiful notes of “Clair de Lune” ring through the theater, then slowly fade out to a dull roar as the focus shifts to Billy, sitting in a world of silence—even while exploring the importance of language and the difference between hearing and listening. It is full of fast-paced dialogue laced with shockingly poignant (but also shocking) lines. The route that playwright Nina Raines takes to new and more honest understandings is through the land of unabashed political incorrectness. The father, played by ensemble member Francis Guinan with commendable subtlety beneath his argumentative exterior, is full of prejudice and criticism that he makes no qualms about voicing. His family has inherited a similar, if slightly more apologetic, spirit, and the play is able to make progress through captivating, if cringe-worthy, conversations. McGinty delivers a compelling portrayal of a man who enters a world he hadn’t realized was his own, while Sylvia’s character, played by ensemble member Alana Arenas, offers an equally compelling depiction of someone walking the line of belonging to two different worlds with as much grace as she can. The set, the first floor of the family’s home, is incredibly interactive; the characters are comfortable in the space. The lighting is varied and well-placed for mood and focus. The interspersed music is successful at creating dramatic effects, and the scene changes are smooth. Steppenwolf rarely fails to deliver a well-formed show. However, the play fails on a few key points that cannot be ignored. An audience member’s impression of the show is a flow of raunchy jokes and a constant stream of colorful words being screamed over a family’s dinner table. While in some ways the swearing serves to make the otherwise very odd characters seem more realistic, it is so extensive that it becomes a distraction from the actual words being said, and the jokes quickly turn to desperate attempts for a laugh based mainly on shock value. The play commits to bringing a volatile, sarcastic, and funny family into existence but then takes it a step too far into the vitriolic, undermining itself in the process. The more trivial disappointments include a poorly-executed intensification of the stutter Billy’s brother, Daniel, acquires as the play continues, as well as a set that incorporates Billy’s upstairs bedroom, which is never inhabited despite dialogue indicating people are in that room as that dialogue took place. Both sap the credibility of the play, though the exaggerated, drawn-out stutter does so more notably. The most important failing, though, is the abrupt ending. The director, ensemble member Austin Pendleton, strays from the script to a surprising extent in the final moments as Daniel’s stutter becomes so thoroughly inhibiting that nothing can be communicated. Pendleton omits music after the last lines, which would have provided symmetry and allowed the significance of the last action some time to be processed or extended. Instead, the final scene merely ends as the actors turn to bow, facing a rather bewildered audience. It creates a rushed and difficult-to-decipher conclusion that resists resolution in an ill-formed, rather than artistic, manner. Tribes is flawed, but it is easy to see how it has earned such warm reviews. It remains largely unprecedented, witty, and perceptive. It tackles identity, family, language, and isolation with richly articulated characters. It manages to do more with two hours and 15 minutes than several plays combined. If you value thought-provoking work, then this is worth your time and money. While full price tickets might not be worth it, if you can get your hands on student-price seats, I wouldn’t waste any time debating. 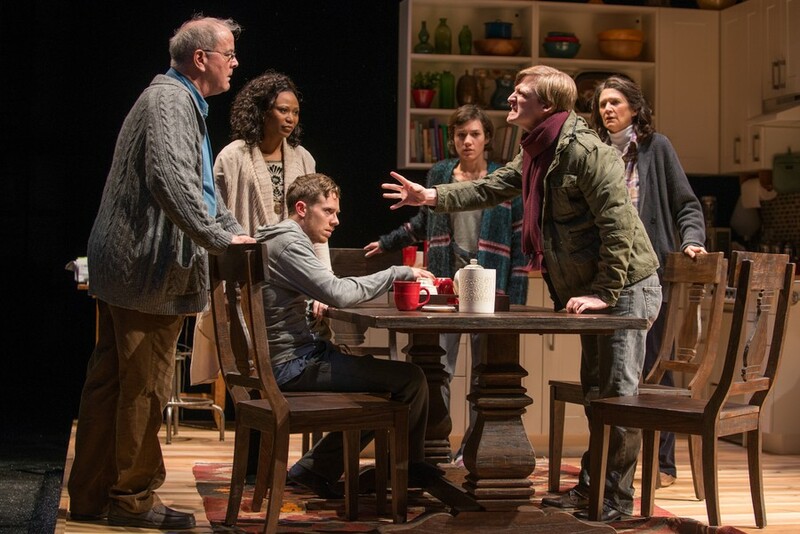 Tribes plays at Steppenwolf Theatre through February 15.